HITHERTO most of the "smaller" European countries have been relying mainly on Great Britain or France for their supply of aircraft, and "home-made" machines are exceptional. Of late, however, ДальшеMore>>> such countries as Lithuania and Roumania - to say nothing of Czecho-Slovakia - have produced successful home-designed and -built machines. One of these, hailing from Roumania, we illustrate herewith and supplement with a few brief particulars. 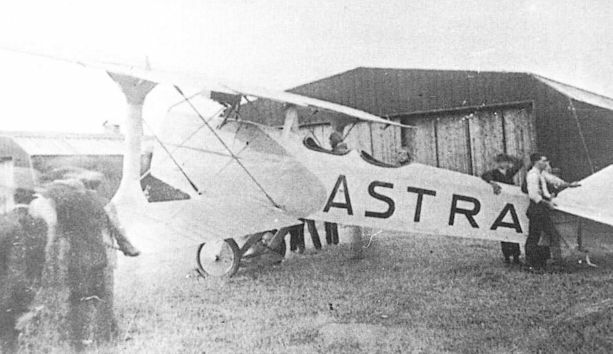 The Sesefsky biplane, as it is called, was designed by Engineer S. Sesefsky, Director of Civil Aviation in Roumania, and was constructed by the Societe Astra of Arad. It is a military machine, intended for reconnaissance work, and is a tractor biplane more or less on conventional lines. As timber is one of the principal products of Roumania, this material is largely used in the construction of this machine. The fuselage is of fair streamline form, comparatively deep in front in order to accommodate the engine, and tapering aft of the observer's cockpit to a vertical knife-edge at the rear. It is of rectangular cross-section, and the lower longerons are doubled from the observer's cockpit forward. One of the principal features of the Sesefsky biplane is to be found in the tail surfaces. The vertical triangular fin is built up of multi-ply wood integral with the fuselage. The horizontal tail surface is comparatively large, and is so mounted as to be adjusted in its incidence. The elevators are of the divided type. The pilot's cockpit is situated just behind the trailing edge of the main planes, from which position a very good range of vision is obtained. Immediately behind the pilot's cockpit in the middle of the fuselage is that of the observer, who also has an excellent view. The engine unit is mounted in the nose of the fuselage, and is totally enclosed by a deep duralumin cowling. In the model illustrated, a 250 h.p. Astra-Benz engine is fitted, but it is possible to fit a 400 h.p. engine if desired, in which case the speed of the machine would be increased from 115 m.p.h. to 143 m.p.h. ; the ceiling, also, would be increased from 17,060 ft. to 23,600 ft.
Two Lamblin radiators are employed for the cooling, these being mounted between the V struts of the undercarriage. The petrol tank is installed behind the engine, within the fuselage in front of the pilot's cockpit. The undercarriage is of the conventional V type with a pair of wheels mounted on an elastic sprung axle. The tail skid is hinged to the bottom longerons and connected by shock absorbers to the top longerons. The wings are of the single bay type, with a single I interplane strut on either side of the fuselage. The top plane, which is of larger span and chord than the lower one, has a pronounced forward stagger, whilst the lower plane is given a slight dihedral angle. Ailerons are fitted to the top plane only. The whole wing unit is braced with steel cable. A comparatively thick wing section, of the bi-convex type, is employed. This machine is equipped with a camera, wireless, and two parachutes, in addition to the usual instruments. The armament consists of two machine guns mounted on revolving mounts operated by the observer, and a fixed machine gun, firing through the air-screw, operated by the pilot. Span 41 ft. 4 ins. O.A. length 28 ft. 2 ins. Height 10 ft. 2 ins. Wing area 394 sq. ft. Weight per sq. ft. 9 lbs. Weight per h.p. 14 lbs. Speed at ground level 115 m.p.h. „ 3,280 ft. 113 m.ph. „ 6,562 ft. 110 m.p.h. „ 9,843 ft. 106 m.p.h. Climb to 3,280 ft. 5 mins. 56 secs. The Sesefsky biplane: A reconnaissance machine, designed by Eng. S. Sesefsky, Director of Civil Aviation in Roumania. 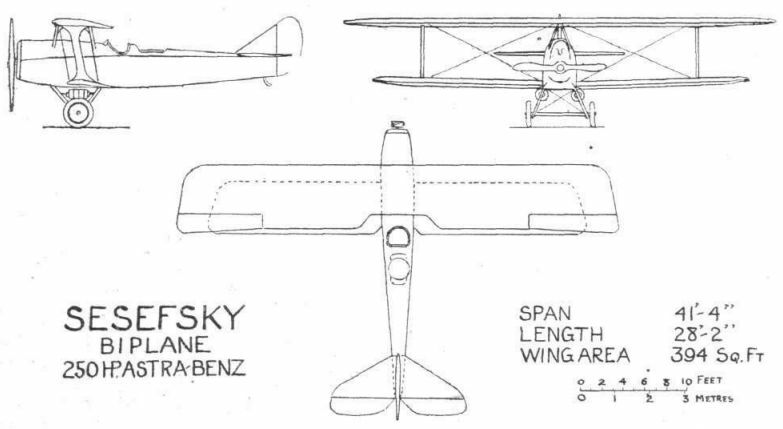 Among the first military aircraft of indigenous design in Rumanian service was the Astra-Sesefsky observation biplane, a tandem two-seater powered by an Astra-manufactured Benz engine.